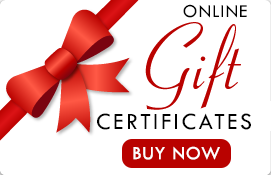 INSTANT ONLINE GIFT CERTIFICATES - just click on the button below and choose your certificate. These certificates can be emailed, texted or printed out from your computer. When you purchase your certificates at our office site you also receive a gift bag that holds your certificate in a decorative display! We can also take your certificate orders over the phone and either mail them to you without the gift bag, or have them ready for easy pick up! In the state of Connecticut, there is no expiration date on gift certificates. Purchase five, one hour massage sessions for $ 390.00 SAVE $35.00!! BOGO Special: Get a Free $10.00 Instant Certificate for yourself when you buy $85.00 or more on-line!